Posted on October 30, 2014 by Ujwala Uppaluri. The latest edition of ITU’s quadrennial meeting of the “supreme organ”, the Plenipotentiary Conference is well underway in Busan, South Korea. It appears that Internet-related issues and India’s position in relation to them will both be very interesting to watch as PP-14 progresses. (See here for one perspective on how the Indian government’s approach to issues at the ITU and to Internet Governance could be viewed.) While there has not been much discussion of the event in India as yet, it remains early days. Regular updates on the proceedings are officially reported here. PPs host important elections each time that they convene, for the subsequent four year period. Houlin Zhao from China has been elected to the position of the Secretary General (152 votes out of 152 countries present and voting, he was the only candidate). See here for a biography. Malcolm Johnson from the United Kingdom will serve as Deputy Secretary General (104 votes of 168 countries present and voting). See here for a biography. India also fielded a candidate for membership to the Radio Regulations Board. His bid was unsuccessful. Full results of the election are available here. The first week also saw elections of member states to the 48 seats of the ITU Council, which governs the ITU in the period between PPs. India continues to hold its seat on the ITU Council. A full break down of the results, along with the vote counts, is here (India is listed under Region E). “Coming to internet services, India has over 300 Million users but the broadband penetration is around 5%. One of the main reasons for low Broadband penetration is also high cost of Broadband connection. Now India is poised to repeat the same growth story in Broadband by bringing down the cost. The full text of the statement is here. It appears that the Working Group of the Plenary (WGPL) will work, through ad hoc groups on the bulk of Internet-related issues. On the whole, WGPL will review 81 proposals and 334 pages of text in 15 sessions, and cover a range of issues including some relating to ICTs. See here for a quick summary of the work. In addition, Committees 5 will be of relevance. It appears that the Indian proposal (titled “ITU’s role in realizing Secure Information Society”, available as a standalone document here), called Proposal 98 will be controversial. See here and here for critical takes on the proposal. An ad hoc group led by Russia will look at Resolution140 (Rev. Guadalajara, 2010) concerning ITU’s role in implementing the outcomes of the World Summit on the Information Society (available here) and Resolution 172 (Guadalajara, 2010) concerning an Overall review of implementation of the outcomes of the World Summit on the Information Society (available here). Along with the Bahamas and Vietnam, India has proposed amendments (IAP/34R1-A1/30, ACP/67A1/12 and IND/85/1) to Resolution 136 (Antalya, 2006) concerning “The use of telecommunications/information and communication technologies for monitoring and management in emergency and disaster situations for early warning, prevention, mitigation and relief”. An ad-hoc group will revise Resolution 136 and report back to WGPL on Friday, 24 October (afternoon). Seven proposals (available here.) have been submitted in relation to Resolution 130 (Rev. Guadalajara 2010) concerning “Strengthening the role of ITU in building confidence and security in the use of information and communication technologies” (USA/27R1A3/4, CUB/70/2,RCC/73A1/16, B/75/4, ARB/79A2/13, EUR/80A1/14 and INS/82/2). The need for any amendment is itself disputed, and an ad-hoc group will consider the question. Seven proposals have been submitted in relation to Resolution 174 (Rev. Guadalajara 2010) concerning ITU’s role with regard to international public policy issues relating to the risk of illicit use of information and communication technologies (CUB/70/3, B/75/6 and ARB/79A4/4). Concerns around this resolution related to ensuring thet there privacy is preserved, even as security concerns are addressed. The matter will be discussed by an ad-hoc group. Four proposals on Resolution 179(Rev. Guadalajara 2010) concerning the ITU’s role in child online protection have been submitted (IAP/34R1-A1/3, RCC/73A1/26, ARB/79A3/6 and EUR/80A1/11) to a unanimous consensus. The United Kingdom, one of the proposers, will consolidate these proposals into a single text. Committee 5 set up an ad-hoc working group to consider revisions to Resolution 177 (Guadalajara, 2010) concerning Conformance and interoperability (see here) and a new draft resolution concerning counterfeit devices (available in consolidated form here). The work of the PP is divided by Committee, and all of these proceedings will be webcast here. However, text will be negotiated and prepared by ad hoc working groups whose proceedings will not be webcast. 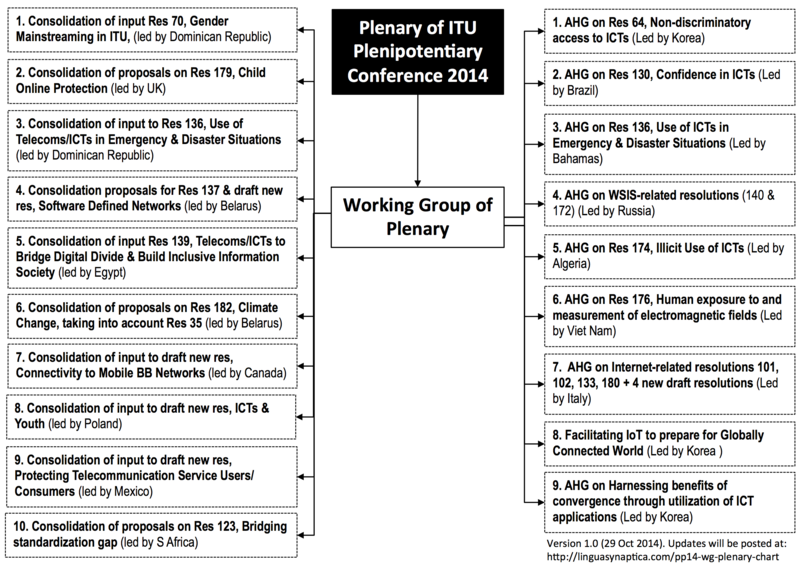 Proposals to open ITU meetings to non-members are slated to be discussed at PP-14. A proposal to make texts of the ITU, such as PP resolutions and decisions, permanently available to the public online has been approved. The language of the amended text of Decision 12 does not cover working documents. Tagged Internet governance, ITU, and PP-14.